Don’t think that cutting corners in terms of quality will ensure a successful build. Your summerhouse will be subject to the elements, which includes insects, mould and rotting; thus, using the right timber is nothing short of crucial. Local woods like pine and ash might be cheaper, but the more durable ones are unfortunately also the most expensive. The best option would be oak or larch, yet this is an impossibility for most budgets. Heartwood instead of sapwood would also be a good choice. Should you choose to order a premade structure from a Northern European manufacturer, remember that neither local pine nor local spruce compare to the Nordic timber species, which grow quite slower and possess much higher density and durability. If you are building your own summerhouse, opt for straight, tight-grain material and use pressure-treated beams for the lowest parts touching the base (be sure to treat these with wood oil or stain). 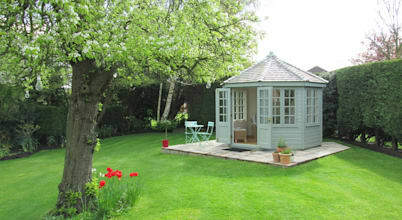 A summerhouse is a great idea for a rear garden’s beauty, but what about the front side? Let’s see 9 front garden ideas anybody can try.